Once again Gavin Hardcastle and I have teamed up, except this time for an exclusive international photography workshop in the Faroe Islands. 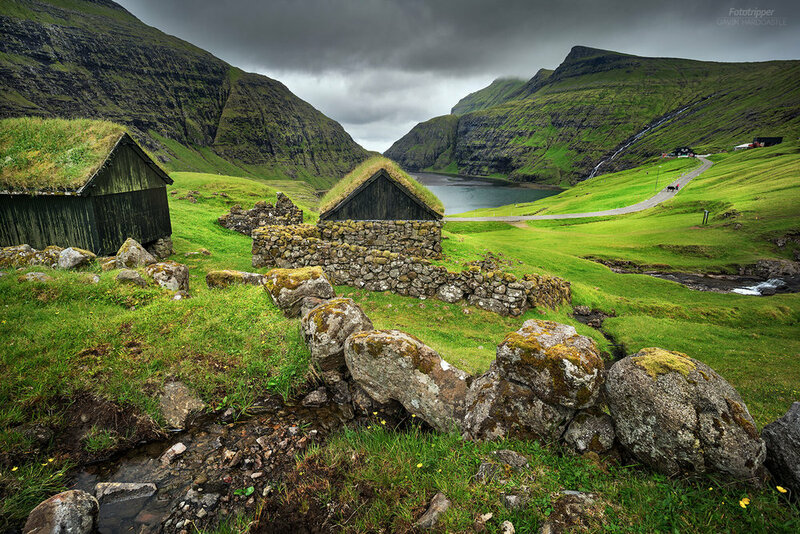 Located north of Scotland and south of Iceland the Faroe Islands offer an exciting opportunity to photograph some of the worlds most stunning scenery. Boasting some of the most dramatic landscapes in the northern hemisphere, the Faroe Islands are a landscape photographers dream location. We'll be photographing spectacular waterfalls that tumble off dramatic cliffs, an incredible hanging lake, an ancient Saksun village, sea cliffs that rise to dizzying heights and dramatic verdant green mountain vistas. With only ten spots available you’ll have lots of opportunities to spend quality instructional time with both Gavin and I and get the most out of this workshop, we’ll even do all of the driving. The register button will take you to Gavin Hardcastle’s website www.fototripper.com where you can register. There will be hiking to and from three of the locations so some level of fitness will be a great benefit. Hiking to a couple of the harder to get to locations is optional and you will have a choice to photograph at a different location if you’re not up for it. Students get themselves to Vagar for pickup. We advise staying one night in a hotel/BnB near the airport before the workshop. ‘Hotel Vagar’ is right next to the airport and should suffice for most peoples needs. We will collect all students from their hotels on the morning of May 25th, 2019 which is when the workshop begins. We start the day with an easy 1 hour hike to the most bizzare landscape you’ll ever witness. The trail to Sørvágsvatn doesn’t require a huge effort and is mostly gentle slopes. The reward is a huge vista that challenges your sense of perspective. Wherever you look on the Faroe Islands, you’ll see waterfalls that beg to be photographed. Some of them are hidden but we’ll share this little gem with you. This iconic waterfall really encapsulates the very essence of the Faroe islands. Even in bad weather you can expect to capture a fascinating shot of this beautiful scene. 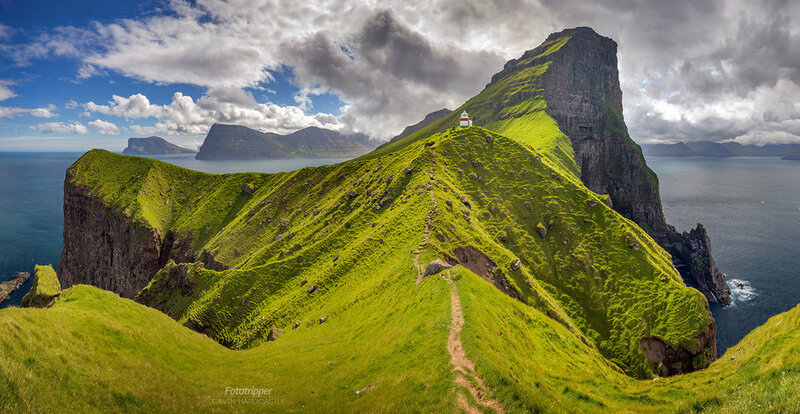 We take the ferry to Kalsoy Island and then enjoy a 30 minute hike to the lighthouse on the cliffs. This is the perfect opportunity to shoot a huge panorama. We head to the Island of Eysturoy to do a short but steep hike under the shadow of Slættaratindur which is the highest mountain in the Faroe Islands. Saksun is a village near the northwest coast of the Faroese island of Streymoy. Surrounded by waterfall covered cliffs, this lush green valley is a photographers dream. Fossa is one of the more dramatic waterfalls in the Faroe Islands. With it’s double drop it’s a hugely impressive waterfall, especially after a heavy rain. As the Southern most Island in the Faroe Islands, Suðuroy requires a two hour ferry ride so we’ll be spending the whole day exploring the dramatic cliffs with it’s interplay of light coming from the West. On day 5 we’ll repeat the same shoots as day 1 but in the reverse order. This gives us the chance to catch the light from the opposite direction which can drastically effect the scene. On our final Day of shooting, we devote the entire day to chasing down some epic sea stacks. This involves a 1.5 hour hike over rough terrain but isn’t very steep. The views are amazing and totally worth the effort. An optional group dinner with photo critiques is the perfect way to round off the trip where we can enjoy a few beers and share some stories. Insurance – It is MANDATORY to insure yourself against physical injury. We also advise that you insure your photographic equipment. Tour leaders will not be responsible in the event of any personal injuries or damage to photographic gear as a result of an accident during the workshop. Wide angle lens, mid-long range zoom. You will have your own private room. We’ll be staying in 3 star accommodation that has everything we need. We’ll be spending hardly any time in our hotel rooms so it’s really just a place to safely store our belongings, take showers, sleep and recharge our batteries.